1999 is Past. 2013 is Gone. But 3012 is Still a Long Way Off! Right? 1999 is past. 2013 is gone. 2016 and the following 8 years will come and go in a flash! But 3012 is still a long way off! Right? 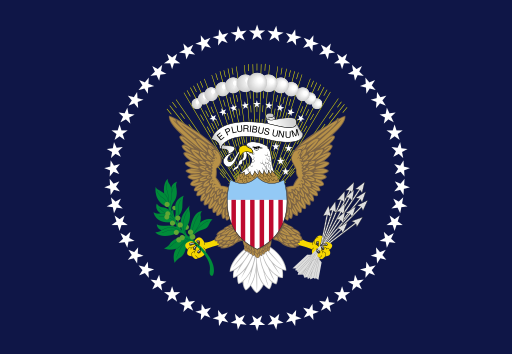 U.S. Presidential flag, 1960-present (not usually called a "standard"
Visualize this. You, a typical AAC (average American citizen), a Student at an American institution of higher learning in the YEAR (??) - timeline somewhere between 2000 and 2012 - have been chosen to spend 15 minutes with the President of the United States (thee most powerful Leader of the free world [or at least he or she would like think so]). It is the 21st century. 1999 came and went. No more partying like it's 1999. The party is over. You - Mr. or Ms. Student - have been given a mission. Your mission ~ should you decide to accept ~ is to identify the two most important issues facing your generation. What two things would you choose to discuss and why? No. This is not a trick question. No. I don't think this question has ever been put quite this way for a Miss America or Miss Universe contestant. Furthermore, your choices have been narrowed down considerably. - F) Making the World Safe for Democracy and Nothing Else Matters.